This is a Creamer. It was designed by Raymond Loewy. It is dated 1954 and we acquired it in 2006. Its medium is glazed and gilt porcelain. It is a part of the Product Design and Decorative Arts department. 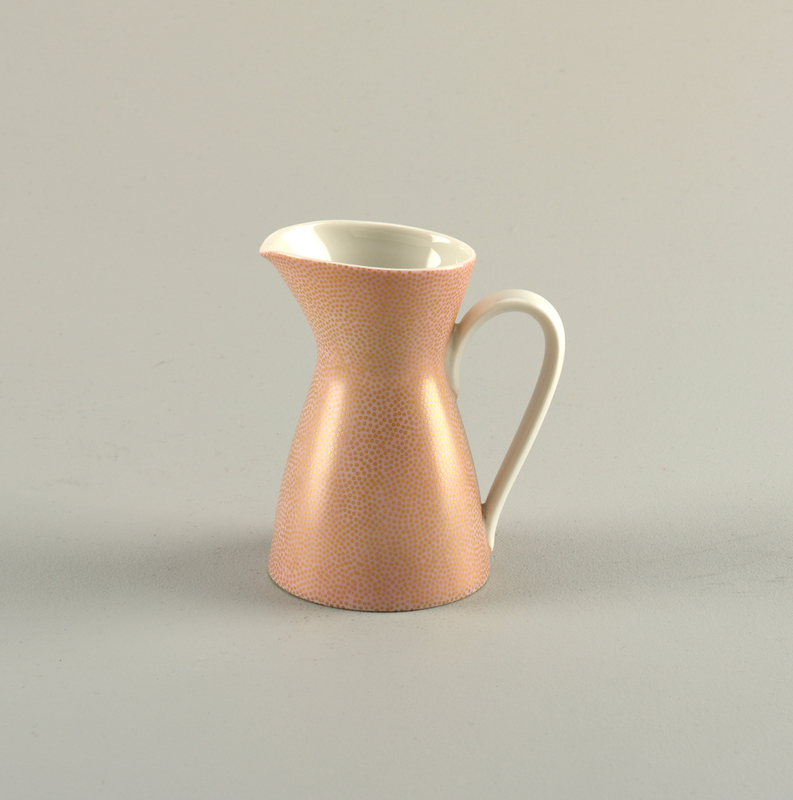 This creamer is part of a set of ceramic tablewares designed by Raymond Loewy, one of the first industrial designers. Loewy’s career spanned six decades, from about 1920 to 1986. Loewy was based in Paris but active in Europe and the United States, with offices in Paris, London, New York, and Chicago, among other cities. By 1951, he directed a design staff of over 140. Loewy and his firm are noted for their prodigious and varied output, which ranged from advertising graphics and logos to designs for locomotives, appliances, cars, aircraft passenger cabins, and even the interior of a space station. Loewy was engaged by Rosenthal porcelain in the mid-1950s at a time when the German firm was recovering from material shortages and lagging sales after World War II. The firm had been founded in the 1890s by Philip Rosenthal, Sr., who lived in the United States for about a decade before returning to his native Germany. From its earliest days, Rosenthal exported its products to the United States, where the company enjoyed strong sales. By the late 1920s, the company had its own import subsidiaries in the United States: the Rosenthal China Corporation and the Continental Ceramics Corporation, both with offices in New York. Among its innovative marketing at the time, the firm sold its wares in shops that exclusively offered Rosenthal; they also developed the idea of “open stock,” so that consumers could buy individual pieces rather than full sets. Nazi-era management relinquished control of the firm in the late 1940s. By 1950, Philip Rosenthal, Jr. had taken over the business. To restore the firm and help increase postwar sales, he undertook an active program to update the company’s designs. The Rosenthal-Loewy collaboration came about by chance, after Richard Latham, Chief Designer in Loewy’s Chicago office, met Philip Rosenthal, who was visiting the United States to revive the company’s lagging exports. Rosenthal offered Loewy part interest in the Rosenthal china production venture, and Loewy was given the post of Chief Designer. Loewy and Latham collaborated on the Rosenthal project. Model 2000 was introduced in 1954. Rosenthal gave it this name, invoking the idea of a classic modern design for the next century. Model 2000 was extremely popular, with 20 million pieces produced by 1962 and a production run lasting into the late 1970s. The museum has targeted Loewy’s industrial design objects for acquisition. This creamer, proposed for acquisition along with its companion pieces—a coffee pot with lid and a sugar pot with lid—would join objects designed by Loewy already held in the museum’s collection, among which are a Purma Special camera (1937) and an in-flight dining service designed for Air France (1970s).